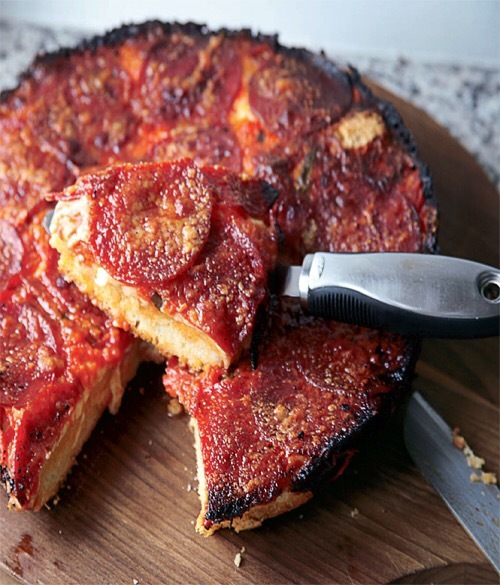 One could call this dish pizza bread, and it is a cross between a focaccia and a pizza. This my favorite types of pizza. Note: you could use any toppings you would like. Pour 1 cup plus 2 tablespoons warm (90 to 110 degrees F) water into a bowl, then stir in the sugar and yeast. Let sit until the yeast begins to bubble, about 5 minutes. In an electric mixer fitted with the paddle attachment, mix the flour, cornmeal, and salt on low to combine while still mixing. Once the dough comes together, switch to the dough hook, and knead on medium-high speed to make a smooth dough, about 2 to 3 minutes. Add a little more water or flour as needed to make a soft dough. Put the dough in an oiled bowl, cover, and let rise until doubled in size, from 1 ¼ to 1 ½ hours. Punch down the dough, and press it into a 14-by-10-inch oiled baking pan or an 12-inch cast-iron skillet, gently pressing the dough up the sides to make a shell. Fill the shell with an even layer of the provolone and mozzarella, then spread the sauce to cover the cheese completely. Top with the pepperoni, and sprinkle with the grated cheese and oregano. Cover with foil, and bake 45 minutes. Then uncover, and bake until the crust is deep golden brown and the pizza is bubbly, about 20 minutes more. Let sit about 5 to 10 minutes before cutting into wedges and serving.